There was a time when a couple exchanging vows had limited means to capture that special moment. Photographs have been around since the mid 1800s. Today’s photos are a far cry from the sepia toned plates of old. Modern age pictures are crystal clear, in full color and can be sent with a click of a mouse. 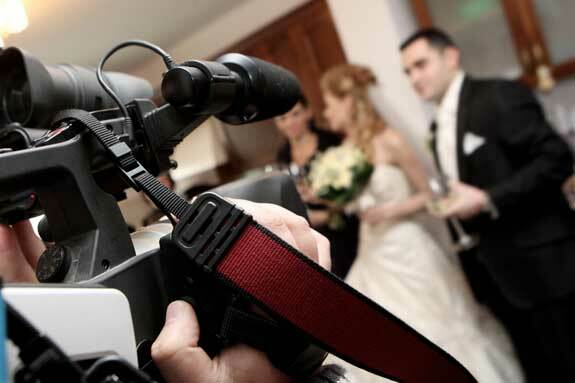 Videography lets you capture the sights and sounds of that special day in a movie-like format. Thanks to the wonders of high-definition video and Blu-ray discs, videographers are able to produce professional quality mini-movies that can be shared with one and all. All you have to do is book the videographer and get ready to be movie stars for a day, or longer. There are different styles of wedding videography. The video journalistic style is more of documentary. The film is created and edited as the event unfolds, capturing your wedding from start to finish. Cinematic videography offers a bit more flash, more of a “wow” factor. It is more dramatic and the videographer edits to create mood and a bit of drama. The storytelling method includes sound bites taken from interviews with the bride and groom, wedding party and guests. These are edited into the video footage. The traditional wedding video is one that captures the day from beginning to end, with little or no editing. Traditional videos can run two to three hours or more, and sometimes look more like family home movies. Short form wedding videos are edited versions that are between 15 and 50 minutes in length. Videographers may use one or more of these methods. The length is often determined by whether the film just includes the ceremony or if the camera will be rolling from the donning of the wedding outfits until the last guest goes home. Many of Maine’s weddings are held outside, perhaps in the fall to take advantage of the changing leaves or on a sandy beach. These are both ideal backdrops for videography. Canopy weddings are often held outside, followed by an outdoor reception. Kids, pets and guests may all be included in the film. Cost varies between videographers and is determined by style, length of video and if other services are included. Sometimes videographers charge travel time, especially if the wedding is in a remote location. Prices can range from about $900 to over $4,000 for a combination video, photography and DJ package. Booking windows also vary. In Maine things tend to book up faster from early summer through the fall colors. As in most wedding plans, the sooner you book your videographer, the better. Maine has professional videographers throughout the state, most clustered near the larger metropolitan areas such as greater Portland, Bangor and Augusta. Some like Sweet Thunder Productions in Wiscasset offer multiple camera operators and coverage of the rehearsal dinner or even a pre-wedding coastal cruise along with a still-photo album. Others like Wedding Videography of Maine, based in Patten, often will travel to all of Maine’s regions and beyond to video your special day. Another company that will travel almost anywhere in New England is Lasting Memories, based in Kittery. One of their specialties is a “trash a dress” party. Sometime after the wedding day the couple and their friends pick out a location for an all day party where the trashing, or dirtying up, of the wedding dress is captured on film. The firm also does “Save the Date” videos. The finished product is uploaded online so the couple can email this 21st century wedding invitation to one and all.